I heard some RUMINT the other day that suggested FLWG will shortly be getting a new patch..
Let's hope so, because the CAP Seal patch is about as 'generic' as one could get for a wing patch. The only way that patch would ever work, and what I think the creator of that idea was thinking when he made that happen was, to have every wing wear that design with rockers designating your wing. Which I doubt anyone would do, and would sooner not wear a wing patch than do that. 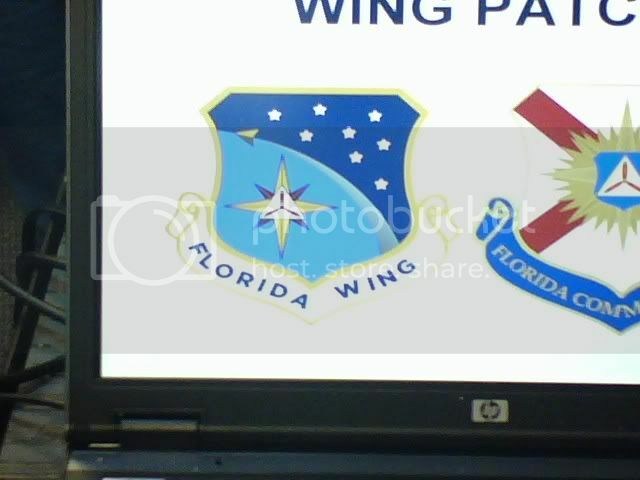 New Florida Wing emblem? Not looking likely. Within the last few weeks, a wing policy letter mandating the wear of wing patches (after National made them optional) was rescinded. That policy letter had been written by an alleged associate of HWSRN before that individual was kicked up to command SER. After the guy who replaced THAT guy was replaced, the interim Florida commander designed a challenge coin that some thought "might make a nice wing patch." As someone who deals with design, I thought it was a flawed idea -- too much little detail to work well as an emblem, plus no original elements. That "nice wing patch" sentiment was RUMINT. If anything, I'd like to see the heritage gator emblem put in a shield and presented again. Someone floated a "new" gator, one that appeared angry and not helpful at all, clutching a first-aid box as if to say "try and take this from me." But there's nothing wrong with the heritage gator, save for the white underbelly on the animal. Hmmm... maybe I have a project to undertake, breaking out Illustrator to do an updated FLWG emblem! Within the last few weeks, a wing policy letter mandating the wear of wing patches (after National made them optional) was rescinded. So does that make INWG the last mandated wing patch wing? Nope, NH is in the list too. Certain squadrons require it too. Minnesota's is too, but let's not tie up this thread with that stuff. That's just asking for a lock! My thanks to Bill Breeze for helping me preserve a copy of this patch, as the unit has disbanded and it probably would have been lost to history. It's required in CA too. Quite tame compaired to the boldness of the gator patch, but a very desent design and layout. And WAY better than the current patch! The 8 stars might be a nod back to the old charter system (08xxx), but I don't recognize the constilation if it is one. The stylized aircraft delta and contrail might reference the space program in Florida. The compass rose could mean almost anything you wanted it to. Hm..... if you use your imagination a little bit, the navy blue can look like florida.... same general shape.... when I first saw the patch I also thought the delta was a symbol of the current space shuttle with the contrails. Yeah, sorta, but I don't think that was intentional... The delta is generic enough to stand for any launch vehicle, since Florida is the launch site for most of NASA and the Air Force's unmanned launches, in addition to being the sole launch site for the shuttle, and in a few years the Constellation Program. DC Florida Wing originally had four groups. not eight. Group 1 was Miami, Gp 2 Jacksonville, Group 3 Tampa, Group 4 the Panhandle. After the number of groups increased to over 20, the Sector System was started and the old Gp 1 area bcame sector A, Gp 2 Sector B etc. I know it has varied over the years. When I joined the were 13. However, there are currently eight groups, seven geographical and Group 800. The group explanation was from my friend that told me about this, and sent me the picture. I thought this thread was about squadron patches? By the thread title, it is, but is it a huge crime for it to deviate a little into a wing patch discussion? Yes, punishable by death... and thread lockage. I would have put this one on ice eons ago, but it's Pylons baby. Thanks for not locking the thread. Wow. Never saw that before. Doesn't exactly say "Florida" to me, and relies on cliched devices too much. I like it, it looks like something the Air Force would use.